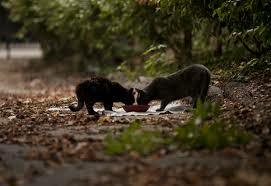 Feral cats are not socialized to people. And therefore, they are not adoptable. Feral cats don’t belong indoors and are typically wary of us. However, as members of the domestic cat species (just like pet cats), they ARE protected under state anti-cruelty laws. Catch and kill doesn’t work. Animal control’s traditional approach for feral cats— catching and killing—is endless and cruel. Cats choose to reside in locations for two reasons: there is a food source (intended or not) and shelter. When cats are removed from a location, new cats move in or survivors breed to capacity. This vacuum-effect is well-documented. Trap-Neuter-Return (TNR) benefits the cats and the community. Cats are spayed or neutered, vaccinated, and ear tipped (the universal symbol of a neutered and vaccinated cat), and then returned to their outdoor home. The colony’s population stabilizes—no more kittens! Trap- Neuter-Return improves their lives and improves their relations with the community—the behaviors and stresses associated with mating stop. Trap-Neuter-Return is the humane, effective approach for feral cats. You can make a difference and save lives. Together, we can educate people about feral cats and the fact that they don’t belong in pounds and shelters, and spread the word that TNR is the humane approach for them. • Removing the cats solve the problem. • I'll get in trouble for feeding. • Feral cats are best served in shelters. • If you remove a feral cat, another will take its place. • When working with TNR there are exceptions to the rule. •We will always be in need of fundraising for this project. Feral Cat Colonies and TNR Programs Take a few years of work to actually start seeing the results. Due to the drastic amount of cats in certain areas. •If you want to help fundraise please contact either the Village of Versailles or the Darke County Humane Society for more information. • Donations can be made the program.